Since we already had the Pinto Bean and ‘Andouille sausage’ made (although with Chorizo) we decided to do some ‘fry bread’ (toast in the panini press) and top with an egg. The pinto bean chili is $1.85 for a full serve, but we had a bit over half a serve each, or $1.11 per serve. This version of the Pinto bean stew is pretty good. On toast with an egg it’s great for $2.07 per serve. 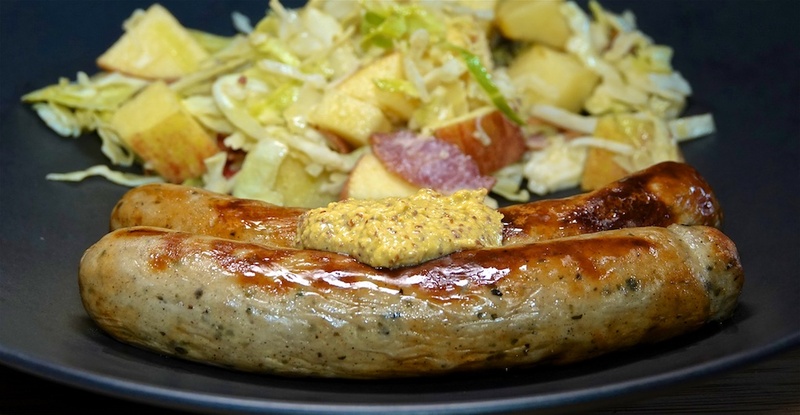 We thought we’d use all the slaw on Saturday night, but with left overs, we rethought our plan and defrosted some Trader Joe’s Bavarian Bratwurst and grilled them to serve with the salad. The salad is $1.19 per serve. A pretty good meal for $2.94 per serve.